World of Tanks, the armored Russian MMO currently in beta testing for the West, has claimed a new world record for the maximum number of concurrent users on a single server. I'd never even heard of World of Tanks until a few weeks ago but apparently it's very big in, you guessed it, Russia, where the game is live and running under a free-to-play model. So big, in fact, that yesterday the development team at Wargaming.net claimed a new world record for the number of peak concurrent users playing on a single game server with a whopping 74,536 tankers duking it out on the battlefield. "The online peak has been growing steadily for the past several weeks, and the PCCU numbers shown by both World of Tanks versions are just astonishing. We are extremely proud of the scale of popularity the game has managed to gain so far," said Wargaming.net CEO Victor Kislyi. "The fact that Western and Russian players keep on joining the ranks of virtual tank commanders makes us believe that more records are to come." 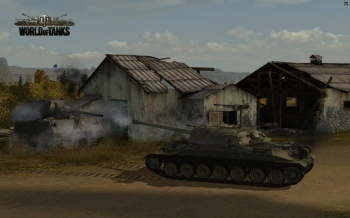 The western version of World of Tanks is still in closed beta but also doing very well for itself, ringing up a PCCU personal best of 16,070 users on December 29, 2010. World of Tanks is a team-based MMO that simulates armored warfare in the mid-20th century, when fire-spitting behemoths were the kings of the battlefield. The game features over 150 German, Soviet and U.S. vehicles prowling terrain ranging from open fields to claustrophobic city streets in a massive struggle for global dominance. If you think that sounds as hot as I do, check out worldoftanks.com to learn more!